New Architrave & A Skinny French Door! We're so fortunate to have the original doors (albeit it with some of them boarded up!) and architrave throughout almost all of the house. But, the exclusion is our kitchen. The room itself is an addition to the house, although a very very very old one and possibly still even Victorian. There's evidence of its age in the brickwork - the fact we can tell it once upon a time had lath and plaster ceilings and even the door frame for the back door has evidence of an old mortice lock. But other than these little hints to the past, there's no period features remaining. 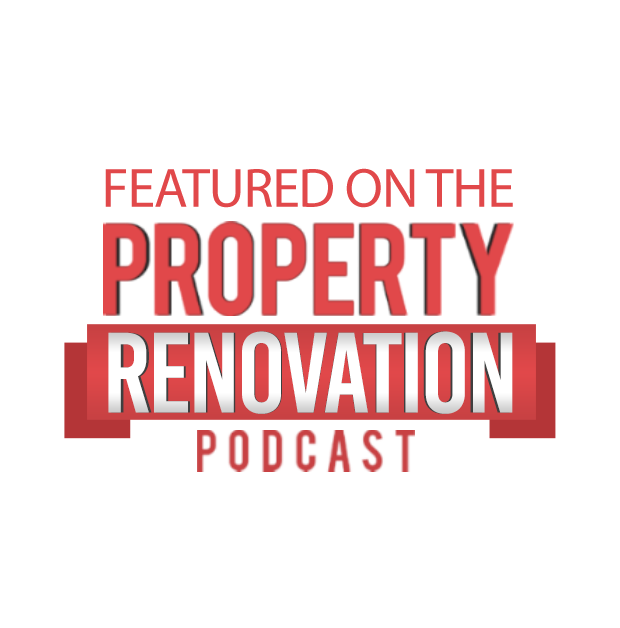 We really want consistent features throughout the house - there's nothing worse than a different style of architrave and skirting in every other room! And since we've opened up the wall between the kitchen and dining room, it's even more important that they match in the same period style. 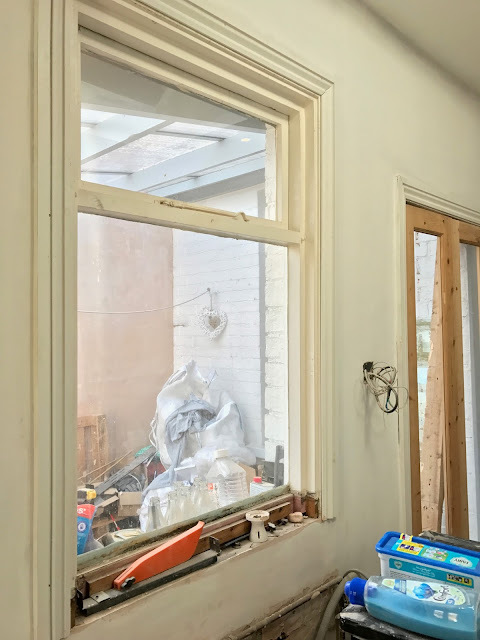 It's a little too early for skirting board in this room, but tackling the very non-period window and door, was something we could get right on with... And more to the point, it really needed it. So, needless to say - we needed to do something here! 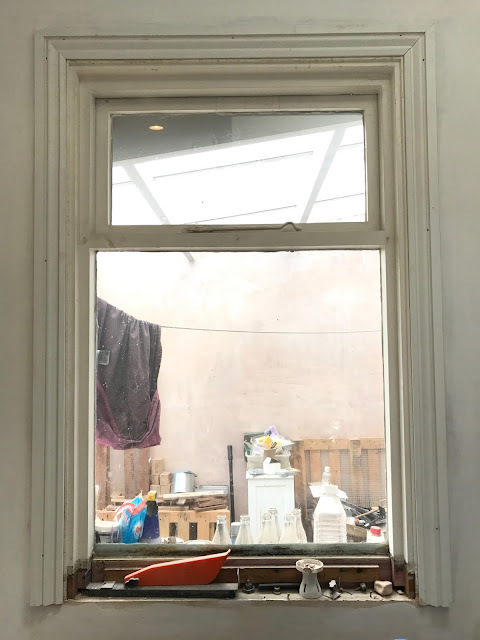 The window sadly has to stay - it's just not in our budget to replace it and I don't actually think it needs replacing anyway. Whilst it is single-glazed, it's not an external window and we don't really loose too much heat through it. But the door just feels as though you should be walking into the garden through it - not another room! As much as I quite liked it (call me a weirdo!) I knew it had to go. It also cut half the room off when it was open, just not practical at all. 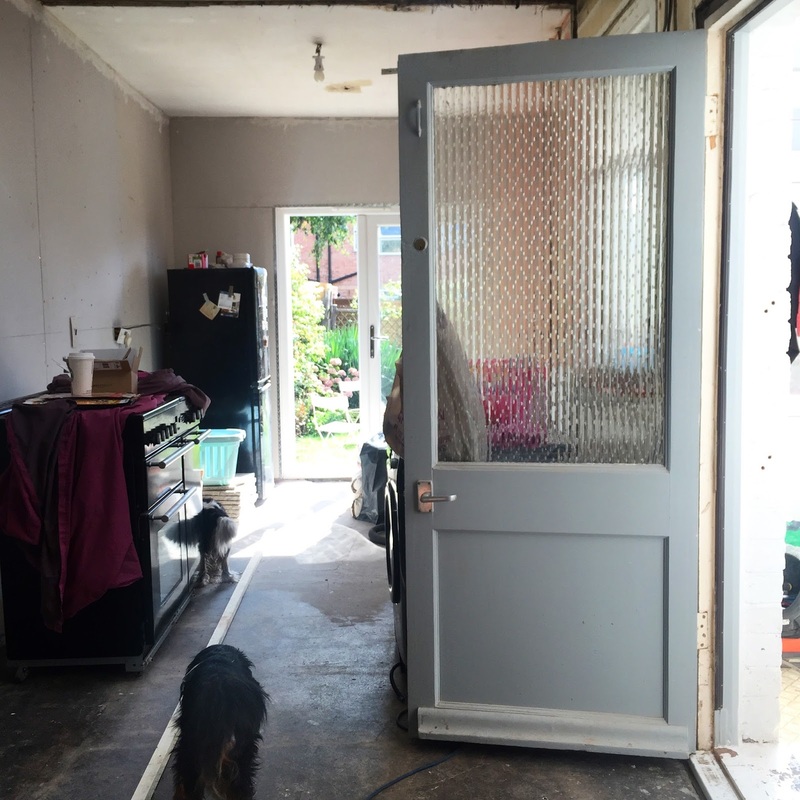 So instead we'll be swapping the door for some period-sympathetic internal skinny french doors. 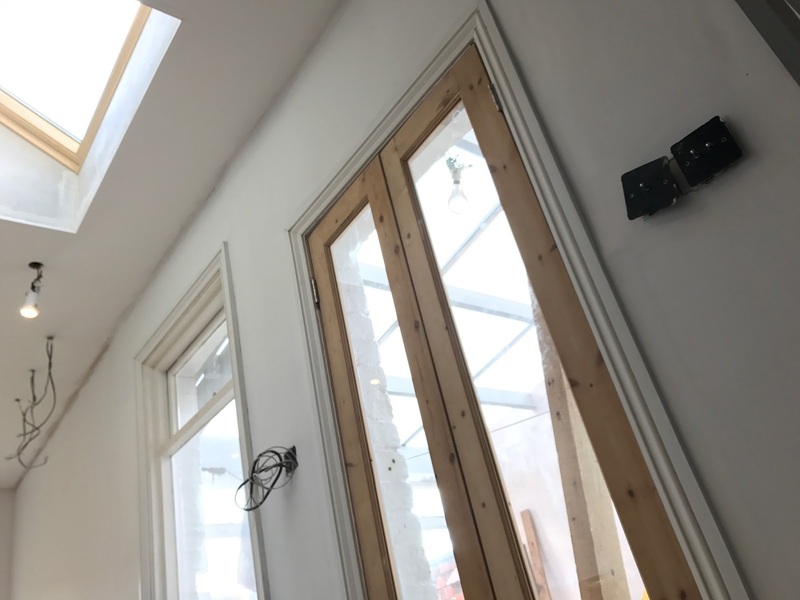 They'll let heaps of light through, connect the conservatory and kitchen better, AND when the doors are open, they wont cut off the view of the kitchen. Win, win! And what's more - I managed to bag a bargain off eBay for just £25! But we'll come back to that later. 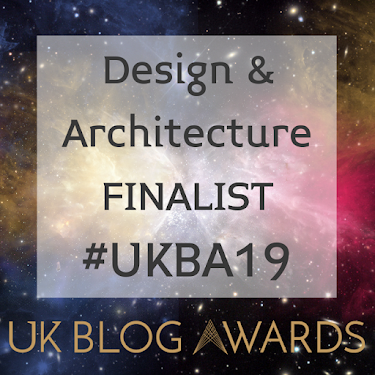 We'll also be updating the architrave for something much wider/grand and in a style that matches the rest of the house and its period charm. So obviously the first job was to remove everything; the old architrave, beading, locks and also the plaster. A sunken architrave just wasn't the look I was going for (does anyone want their walls to look like quicksand?) and there wasn't any other way around it. 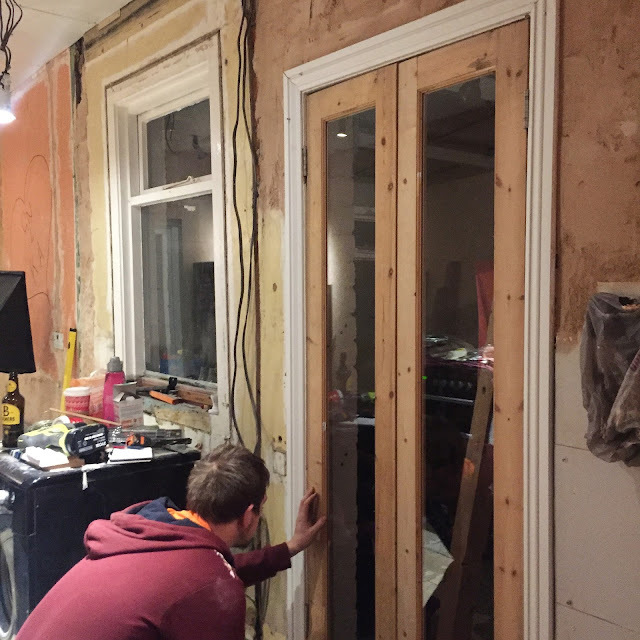 I used my trusty muti-tool to carefully cut away the architrave from the frames and then used a crowbar to pull it off. Grant also carefully removed the old lock, freeing the screws from a bazillion layers of paint. As we removed the many layers of quicksand.. 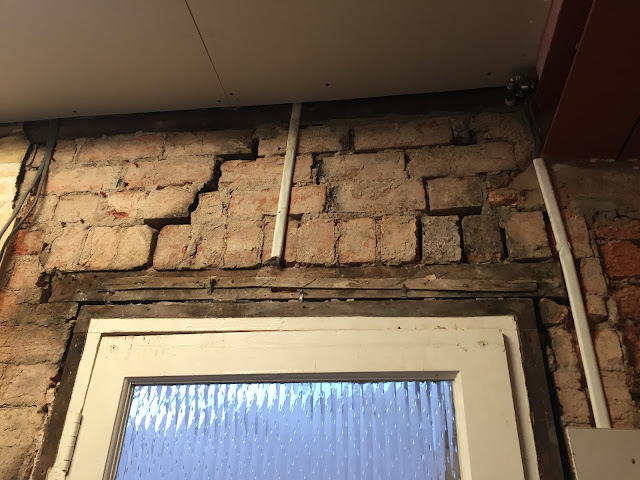 Sorry, I mean plaster - we also discovered a rather large crack in the brickwork above the door. Which I guess at least explained why it had been plastered so many times. 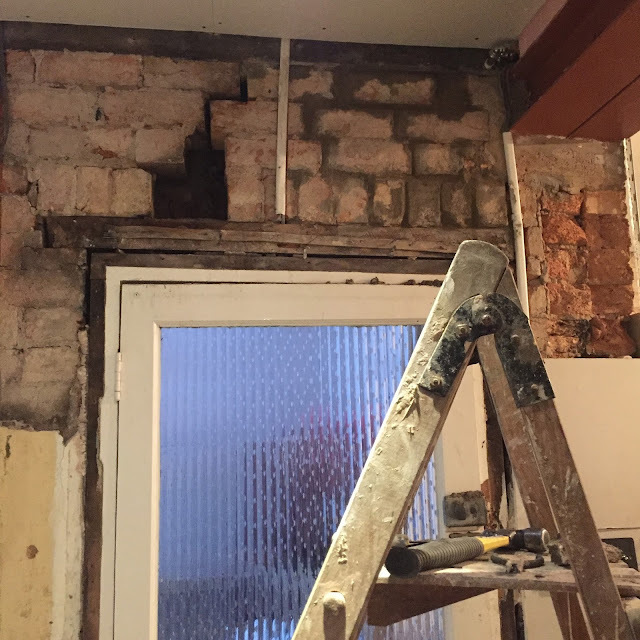 Luckily the two lintels above and below the crack had no signs of damage in them at all, so I simply removed all the loose bricks and re-bricked it all back up. I say the words simply, in truth it took me weeks to get my arse into gear and do this. I always have some unrealistic fear of the house falling down whenever we come across stuff like this and it clicks off an overwhelming feeling of reluctance in my brain. But once it was done (in the space of 30minutes!) it was so silly to have been putting it off. We then decided to add the architrave around the door before plastering. I know that sounds so stupid and backwards but we had a good reason for this. Despite thinking the many layers of plaster was to blame for the sunken architrave - it also turned out that the door frame was a bit twisted as well. By that I mean, the frame was lower than the bricks on one side and on another side, the frame was much higher. Short of building the frame out on one side (and then having a the door appear more recessed, on one side only) we had to kind of accept that the architrave was going to have to be sunken into the architrave just a little bit. 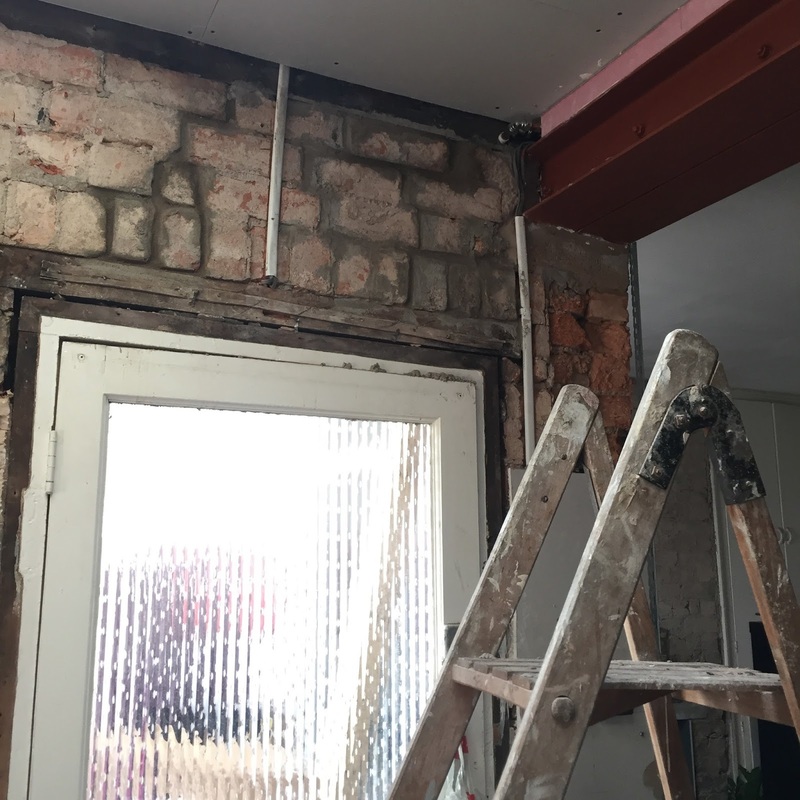 And plastering up to the architrave was (we felt) much easier than trying to fill-in the gap for it later on. Or trying to fit it over imperfect plastering (which it would be - as we're doing it ourselves!). Am I making any sense? 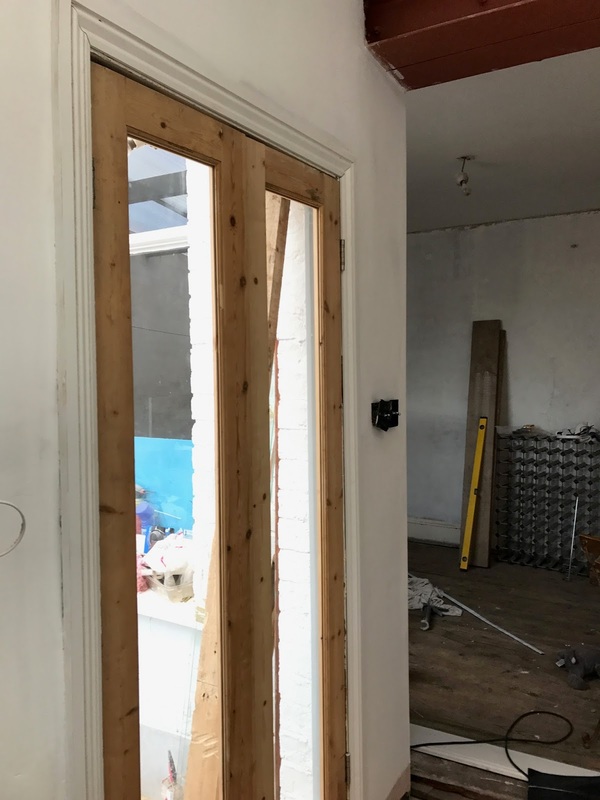 We also splashed out and purchased an actual mitre saw for this job as well - we've always used a handsaw with mitre box in the past - but after having done so many rooms (and still the skirting boards and many more rooms to go!) it just kind of made sense to start investing in proper tools. And I'm so pleased we did! It's bloomin' amazing; exact cuts, every time! Seriously if you're on the fence about getting one, just do it! 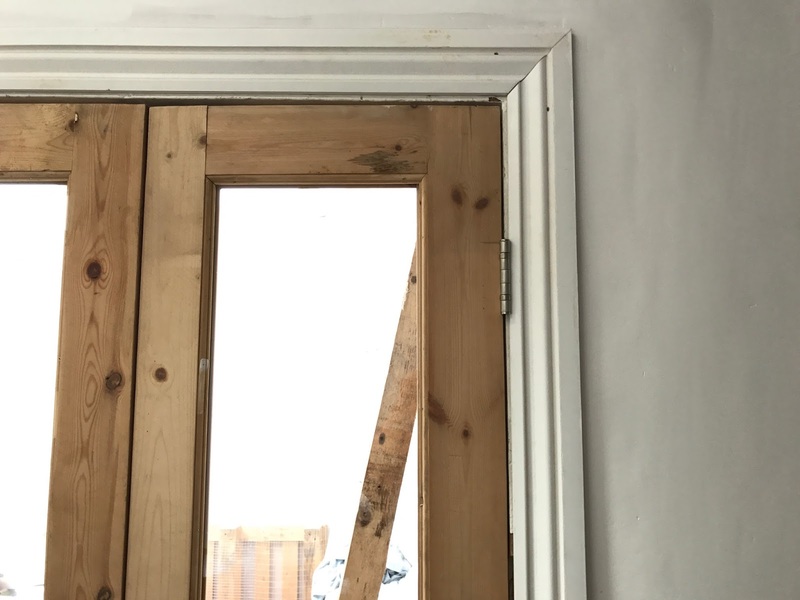 There's a few different methods for fixing architrave to a frame - but we opted for just nailing it in without the use of any glue. Because we haven't plastered yet, we didn't want to commit to glue, just in-case we needed to take it back off for whatever reason. (turned out we didn't need to - but there ya go!) 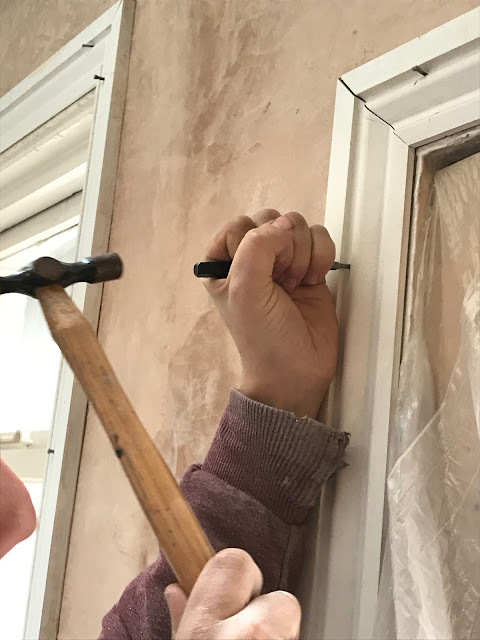 When using nails, you want to make sure you nail it into the architrave at a point where the nail will be easy to conceal later on - usually that's in a recessed part of the moulding. You'll also need a nail punch kit which allows you to fully sink the nail into the architrave where using a hammer alone otherwise wouldn't. Even after just a coat of browning plaster, things were already looking much better - I love how crisp the architrave looks! So although I say the door was the right size, it was actually around 4mm too big widthways. But this was perfectly easy to shave off with the help of a planer (another new purchase - we're on a money spending mission here!). I'd never used an electric planer before - and I have to say, I'm not sure I've quite got the technique down just yet.. But after a few practise sessions, it worked out okay. We also had to plane a little off the corner of one door, because our the door frame wasn't quite square. Definitely not ideal, but we're talking mm's here and once the doors were hung you really can't tell at all. Grant then chiselled out sections of the door and frame for the new hinges. We're using some lovely Satin Nickel ones I'd also picked up from eBay! We also purchased some new glazing panels for the door as one of them sadly had a crack in it. Despite one being fine, we decided to replace both, just to make sure they definitely matched in clarity and neither had a slight differing tinge to it. We opted Laminated glazing, so that should it ever break, (violent door slamming kids of the future, perhaps!) it'll do so safely. 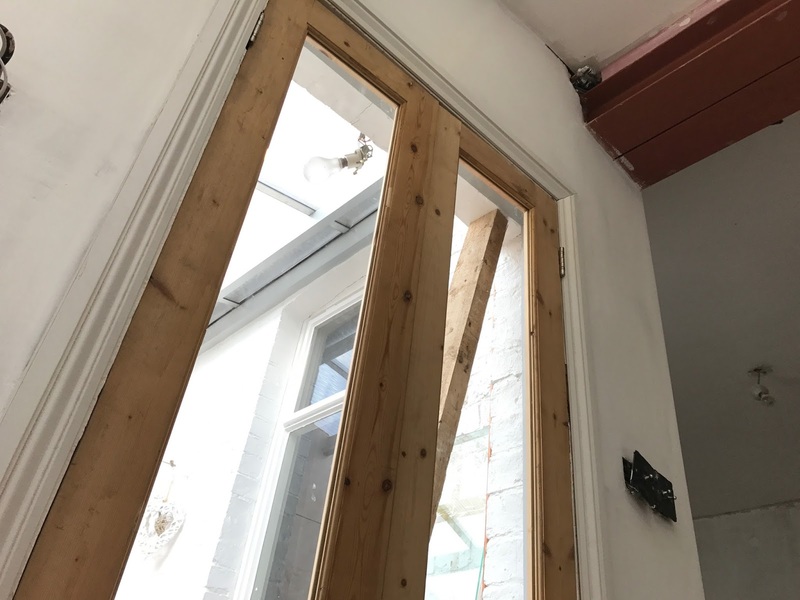 The cost of the glazing actually cost more than the cost of the door at £42 - but that was still half the price of some other companies we had quotes from! We purchased the glazing from City Glass in Lincoln who cut it pretty much the next morning. Fab service & fab price! Grant then secured it with some beading (also purchased with the door) and nails, using the nail punch again to sink them right in. I think the door looks brilliant - as if it was always there. The wood's a little scuffed up in places, but I think that adds to the charm and makes it look old and characterful and not entirely like a brand new modern set of doors. I'm not one to gloat, but c'mon - HOW much better does the window and door look now?! It makes the room feel so much less like an outbuilding. The door has so much charm - I freaking love the exposed wood finish, although it could probably do with a wax finish over it. It also lets in so much more light, and coupled with the new period architrave - it looks like it was just always there. I think it looks amazing already. It almost feels like home! Sneak peak at our new tiles too! What do you reckon - an improvement? 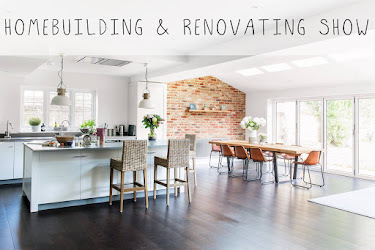 Have you tried MDF architrave and been converted too? *Architrave was kindly provided by Skirting World in return for this post. All reviews and opinions are my own. 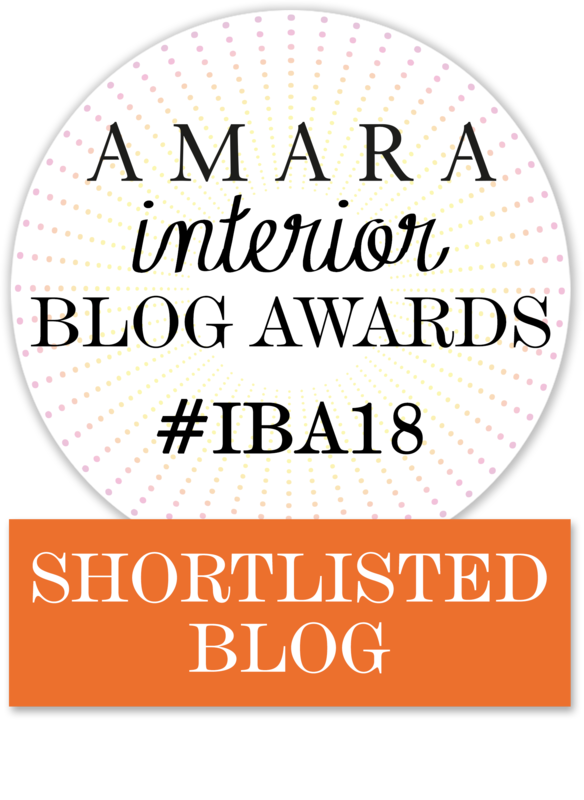 Thanks for supporting the brands that support this blog!